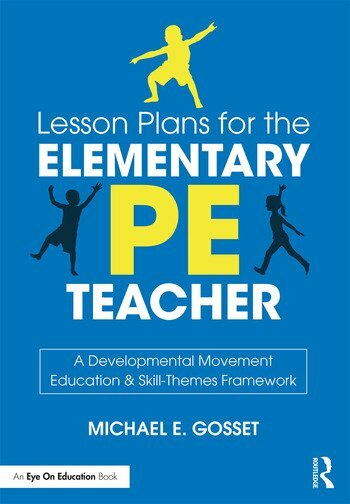 This new book provides PE teachers with practical lesson plans for teaching movement at every elementary grade level. The book’s movement and skill theme-based approach, which differs from the typical activity-based approaches found in many schools, helps students develop overall health and well-being regardless of sports interests and hobbies. Each lesson plan is broken down into subsections to illustrate the physical, cognitive, and affective benefits, the central theme or concept to be explored, the grade level, and the equipment needed. By sequencing these lesson plans so that students develop general body awareness and coordination before finer motor skills—like throwing and catching—the author offers a model of PE instruction that will promote healthy lifestyle choices long after graduation. Michael E. Gosset, EdD, is a lecturer and Coordinator of Physical Education at Hostos Community College, City University of New York. Prior to that, he taught physical education, primarily to grades K-8, for more than 25 years. He has written numerous articles and is an active contributor to STRATEGIES, a journal for sport and physical educators.